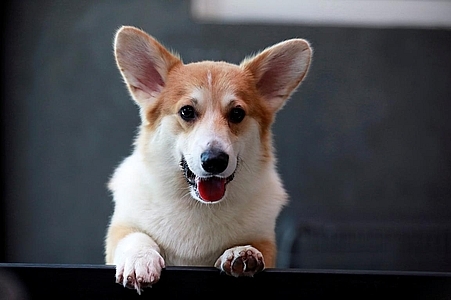 When customers walk into Bangkok's "Corgi in the Garden" cafe, they're greeted by a dozen corgis rushing out to greet them, jump in laps and shake hands for treats. The cafe houses 12 corgis, whose popularity has been soaring among Thai dog lovers for their roly-poly build and an almost infallible ability to make people smile. "They're funny dogs, like their appearances, short and stubby. These are their unique appearances which I like," said cafe owner Tanchanok Kanawaong, the cafe owner. "And I also like their laughable characteristics as well, they're so funny." In Tokyo, Bangkok and other cities, "cat cafes" have been popular for years. The corgi cafe is roughly the same model - just for aficionados of the specific breed of dog most famously beloved by Britain's Queen Elizabeth II. In Bangkok, Tanchanok's commoner corgis are being put to work six days a week - but with plenty of nap breaks and run time in the garden, she says. Customers pay about $11 for one-hour sessions with the dozen corgis with names like Porkchop, Pumpkin, Salmon, Bean, and Babycorn. One customer, 36-year-old Chutima Jaroonjintayanon, said she's here to "learn more about their characteristics" as she was considering getting a corgi of her own. Tanchanok said she hadn't planned on running a corgi cafe, but a surprise litter of pups gave her the idea. "I just wanted to share the love and happiness," she says. "Two of my dogs had seven puppies ... and the number grew, so we wanted to spread the joy with others."